Okay. I know mea culpa. I've been away for a while. First things first. Lots have been going on/happening around here. 1) I had a birthday that another Shetland shepherd shares with me (hint: he's got a blog with Shetland sheep and his passel of dogs). It wasn't a big milestone birthday, just a normal another year older and hopefully wiser day. Tim got me a kitchen towel weaving kit for my Leclerc Artisat I've had taking up a bit of space upstairs. He's okay about enabling me with my fibery goodness as long as I do at least one thing on it. This is my first thing on my own loom. I took a class where I wove a scarf back about 2 years ago. So far so good. The edges are not even, but for a second time at a loom, it doesn't look too bad. What do you think? 2) A nasty ice storm came through brought a little ice and bit of snow. Even though we had not so much ice around here, we ended up losing our electricity from that Friday morning until close to mid-afternoon on Sunday. Our pellet stove requires electricity, so we were relying on a Mr. Heater that kept the place a balmy 60 degrees. I like it much warmer, so needless to say, I was bundled to the hilt! Tim kept looking every day for a generator, not knowing how much longer we'd be without power and wouldn't you know it, he found one on Sunday and was cresting the slight rise in the road to the house when the power came on. Murphy sure has a sense of humor. We're keeping the generator even so. Never know when we'll need it again. To water the sheep, we had to haul water from a spring house/collection point. Luckily we have a stream that runs by the property and a spring house on our property that are both downhill from the sheep and house. We opted to get water from this one that is right next to the road and on a much flatter surface. The picture was taken while I stood on the road looking at it. The water level is that dark area. The first time we took water from it, I had to break the small layer of ice and dip the water out bucket by bucket. It dropped the level down a bit, but by the next day, the level was back up to it's normal amount. 3) We split up the breeding groups the weekend after the ice storm. Round one done! We'll be using Bergelmir for cleanup around January 10th. Hopefully he'll not be cleaning up anyone, but if so, then so be it. Rams were put together and as Tim always puts it, it smelled like a bordello in there for a while. We do the scent and stuff technique which works for us. Here's a picture of the girls enjoying a sunny day today. All 14 are there. Can you pick them out? 4) We added lights into our chicken coop prior to the ice storm and wouldn't you know it, during the ice storm (when the lights weren't turning on or off) they seemed to kicked it into gear. They started laying much more prolifically and so now we're getting anywhere from 6 to 10 eggs a day. Woo hoo. I am an office supply freak, so I purchased some half dozen cartons and a stamper for the cartons that identifies our farm. No, the cartons aren't exactly office supplies, but you should have seen the stamper they sent with the rubber stamp. It's the biggest one I've ever seen. I can ink the whole stamper at one time. Yes, a bit over the top, but I really like the stamper and envision other uses for it too. 5) The holidays are upon us. So far we've survived Christmas unscathed. We opted to stay home and not travel to either parental unit household. New Year's Day will find us once again on the road to visit my folks. I think that's all the major details for now. I keep trying to squeeze in some spinning, knitting and dyeing. I finished Tim's Freya mittens, so now he has matching (meaning the same sheep) hat and mittens. I just overdyed some musket roving to a nice blue color. It looks good if I do say so myself! Take care and talk to you in the new year. Adrienne's on the run to tell you it's time to find new homes for some rams we have. First, we have Contented Bergelmir. To see his pedigree, just click here. He's an Ag grey ram who carries wild spotting. Just look at the post when he was born and you'll see what I mean. He's really coming into his own and looking like a a great ram. If he doesn't find a new home shortly, we'll be using him for clean up of all the ewes in January. At this juncture, he's unproven. Secondly, we have Contented Theobroma. To see his pedigree, just click here. Theo is a proven moorit ram. He's a gentle ram that understands his place around humans. We used him last year on two of our ewes (to figure out what they were genetically) and he threw twins both times. I just love the light patches he has on his face. Very striking. They were also visible when he was a lamb. If any of these rams catch your fancy, just give us an email or post a comment to the blog and we'll get right back to you. Our prices are reasonable ($150 for unproven and $200 for proven) and we figure registration or transfer costs are ones that we should absorb. We do have a discount when you buy two or more. Lambs, like #15 also come with a horn guarantee. If for some reason, his horns turn wrong we'll refund half the purchase price. 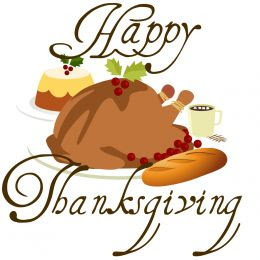 May your day be filled with good food, great family and friends, and so many things to be thankful for that you need to borrow your family and friends fingers and toes to count off your blessings. Tim and I were able to put our breeding groups together on Tuesday. We always try to do it around Veterans' weekend. I've been a bit under the weather, so I didn't get shots of everyone the day they went into the groups, but I can give you a heads up of how it went and if the blasted rain would hold off, I'll grab some shots and upload them. First off, each lady needed to get a pedicure before meeting their big date. First up was Sage and Celebrian. After pedi's done, Tim got the pleasure of dragging (actually she kept rolling a number of times) Sage while I walked Celebrian to the hog-paneled pen near the old J.D. baler that they would be staying in. We then grabbed Bach to meet his women. The funny thing is that they all sniffed and then Bach went right over to the hay and started munching down. Mmm this hay is good! Next breeding group would be Freya, Helle, and Rafn to go on another hog-paneled pen on the front lawn. Tim took Freya, who funily enough acted much like her mom, Sage. I got Helle and Rafn to move to the pen in leaps and bounds. They were given Gulliver, who sniffed and started immediately pawing Freya (who was having nothing to do with him). Third breeding group included Sabrina, Mulan, and Rosemary to go to the dog's kennel complete with filled in holes and a blue tarp for shelter. I thought that I would be real tricky and take Mulan, who after all is a Gail Former sheep, so should lead properly. Guess what? She didn't want to budge and kept putting on the brakes and dropping her hind end. Sabrina and Rosemary moved much better for Tim. I kept putting pressure on Mulan and every so often she would do a jump (which would release pressure on the lead nearly making me do down! ), but eventually she got to the dog's kennel. They were then introduced to Balder who showed a keen interest in Rosemary, but who was also not interested in him. She was much more interested in eating the grass in there. Last, but not least, is the grouping of Viveka and Rakel (aka the bruiser twins) and Sylph. 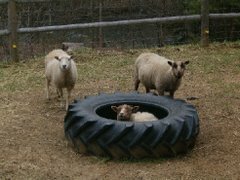 They stayed in the normal ewe winter quarters and were introduced to Uber. Uber wasted no time and found that Rakel was receptive. He must have mounted her at least 5 times. If you're counting, you realize that there's 3 other ewes who won't be bred that were put in a separate pen near the barn. There's also a bachelor pen of 5 rams (anybody interested in a ram or 3?). One more pen was created when Wilkins came back from breeding 6 ewes in Meriden, NH for a 4-H'er. He's currently sharing residence with Arcturus (our wether) until his quarantine is over. All told, we'll be and have been taking care of 7 pens of sheep. This will stay that way for 36 days (a good 2 cycles) and then we'll bring all the girls back together for 2-3 weeks and then separate out those 3 non breeders and use Bergelmir to clean up anybody who didn't take. At least that's what we'll be doing in theory. Changes can possibly happen. Tim's away helping Nadine and Glenn put up 5 acres of high tensile electric fencing. So, it's just us chickens. Here we are, the Partridge Chanteclers. Mr rooster is in the center of the picture. They were created in Canada to withstand colder winters. Each chicken has a slight bump/nub of comb on them to prevent frostbite. Another shot of the girls. Here are the Barred Holland's. They are also a dual purpose chicken, like the Partridge Chanteclers, but they lay white eggs. Actually, they look more like eggshell white (not as bleach white looking as those in stores). Rooster in the center (looking a bit more greyish than the hens. Here's another shot of them. Okay, now you see the sneaky part. We ordered two roos of each breed. The Partridges are down to one roo as the other was getting really persnickety (read mean). Needless to say, he was enjoyed in a nice wine based marinade. We still have two of the Barred's as they haven't been really mean to us. We will eventually take care of the one (who happens to have a crooked middle toe - like it was stomped on or has arthritis). Just not right now. Okay, it's more than just us chickens. There are the 2 cats, Adrienne the Border Collie, the 11 rams (we're trying to shrink that number down) and the 14 ewes. Since it's after Halloween, we've got a real good deal worked out with a pumpkin farmer to pick up his pumpkins to get them out of his field (before he discs them in) and we get pumpkins to feed the sheep for an extra energy boost. Here's some of the pumpkins we picked up over by the girls. Normally we go for the pie pumpkins as they last longer, but as they say beggers can't be choosers. They pointed out to Tim where the pumpkins were this year (they rotate them each year) and unfortunately showed him where the regular jack-o-lantern pumpkins were. C'est la vie! Here's a shot of some of the girls. It's a bad shot, but you can see 3 black girls (Sage, Freya, and guessing Rosemary (can't see the ear tag). Fee Fee is also there (white) and one of the kat twins (either Rakel or Viveka). A grey girl (my guess is Mulan) lying down in the foreground. In the next picuture, there is Celebrian (moorit in the background), Rafn (black ewe peering around bale box), Helle (grey in front of Celebrian), Sabrina (white), Sylph (grey lying down to left), Arwen (moorit) standing betwee Sylph and there's Mulan again. Looks like we're missing a few girls. Brisingamen (black ewe lamb from Freya) and the other kat twin seems to be missing. Probably chilling out near the barn (that would be to the left of the last picture. Soon there will be breeding groups. Stay tuned to see who goes to whom. I sell some of my Shetland stuff on Etsy and I joined the Made in Vermont Etsy Street Team a while ago. I'm not very active on the team, but I figured it was a good way to get my feet wet to that aspect of marketing. Well, normally a shop is picked to be featured. I finally got picked! Just go to this link to find my feature story. I'm famous! Well sort of. I appreciate when I get comments from people. I was surprised once when Kara M. mentioned that she looked forward to seeing my new sheep on the blog (when I was heading out to MI) as I hadn't updated the blog in like a year or so and hadn't really advertised that I had it. Well, Jen Johnson recently gave me a comment about how she liked my hershey kiss cap. This was a comment left for the NE meeting summation and I couldn't figure out what she meant until I looked at the picture of a few of us going out to look at the sheep. She's talking about my hat. Actually to be clear, it's a hat I made for Tim with some of the first spun Shetland and came out really big. Remember that kid who wore a cap that covered his face on Fat Albert?? Well, it looked like that before I actually started felting it to make it shrink. It's still kind of funny looking, but Tim and I always referred to it as an elf hat (because of the funny bingle at the top), but when Jen mentioned the hershey kiss, he said that he never thought about it, but it does look like that, too. Well, just knit up a new hat for Tim to take as he travels to Wyoming this week. Don't want him to freeze his ears off. Perhaps I can coax him to take a pic of himself while out there to share with all of us. Tim and I went to Linda Doane's house on Saturday, October 4th for the annual North East Shetland Meeting. This meeting I know that I always look forward to going to. It's nice to see familiar faces, and sometimes we see new faces. We've been going to the meeting since we got Shetland sheep (perhaps it was one year prior to them??). Each year, we met new faces and always felt welcomed by all. I always suggest to people new to Shetlands to go to the meeting. You learn a wealth of information and get to meet like minded folks. They have to be like minded to love Shetlands! After sorting and chatting about colors and sheep in general, we ate a nice potluck lunch. When we finished lunch, we started on our way to see the sheep. Pictured below shows Scott, me, Faye and Linda (behind jeep). The first sheep we encountered was the ewe flock. True to form, Ginger (I think that was her name) marched up to say hello and ask for scritches. She's Linda's flock greeter and a nice older ewe. We were also eyeballed by the flock guardian. We all passed muster and continued on our way. Excuse me, but I think you have something stuck between your teeth. We looked at different ewes with different facial markings. Like the ewe pictured below. Moget faced?? This ewe had a lovely face and markings, too. Then we went on to see the lambs. Linda showed us the organic pellets she's been trying with the sheep which are Aloe Vera with garlic and kelp. They looked interesting and the lambs ran up to the feeders to gobble them down. After finishing with the lambs, we went back up to the house and said our goodbyes. It was a nice day to talk "shop" and we can't wait for the next meeting next year. For those of you who didn't come, I missed seeing you again. Hope to see some of you there next year. To stay up to date on when we next meet, or anything else of interest to those in the NE region, sign up for the NE Shetland Yahoo Group. Tim has been having some talks with the chickens as they haven't started laying yet. He's told them that if they didn't start laying soon that he was going to eat them one at a time. I didn't realize how persuasive his talks were to the chickens. Tonight, when closing them up for the night, Tim spyed an egg! The Partridge Chanteclers have done a good job! This is our first egg from our own chickens. It's kind of small, but I'm really happy. He found it on the floor of the coop, even though there are nest boxes in there for them to use. We'll need to do some things to make the chickens feel confident to use the boxes. Now we need to start cajoling/threatening the Barred Hollands! This is the third year I've been involved with the Civil War Expo in Vermont. This year, the expo was in Chester, VT (which is a bit closer than Tunbridge - where it used to be held). My friend, Ruth Ticknor, spun with me the second year as well as this year. This time around I was pleasantly surprised to see a weaver (young girl not in period costume) as well as a bobbin lace maker and tatter there (who was in period costume). Duh! I probably should have taken pictures of them too, but didn't think of it. Can you tell I'm not used to thinking of taking pictures for the blog. We were all in a room in the Historical Society building. At the Expo, there is always a scavenger hunt where a number of questions are created and kids and adults need to go scavenging around the Expo looking for the appropriate people to ask their question and get the answer. At the end, when they've gathered all the initials on their pieces of paper, they return to the educational booth and get a prize. If remembering correctly, some metal object. They like us to come up with different questions so that they don't say, "I remember the answer" and don't bother to interact. Luckily, dealing with spinning and fiber, there are lots of questions that can be asked and it should be a number of years before we run out of questions and have to start repeating the questions. This year the question was What is the oldest form of creating fabric that is still used today? Any guesses? Does this picture help you with the answer? Yes, I understand there's a bit of clutter behind the table, but just focus on the table. Of course, it's felting. We didn't actually deal with water and show how to felt, as that would have been messy in the room. Also, luckily for us, most of the kids had done some sort of felting in school or other groups, so when we mentioned felting and showed them the objects, they all went "oh, yeah!". In the past, all we would do is demo and have business cards ready in case anyone was interested. This year we also opted to ask if we could bring some items to sell. Ruth created drop spindle kit baskets, just in case anyone was interested in trying their hand at spinning. We both also brought some hand spun yarn, too. We had only one sale, but that wasn't too bad. One sale is better than no sale. I was a bit unprepared and didn't bring any business cards, so when I had a sheep inquiry, I put all the information to contact me on the back of Ruth's business card. Here's my little niche that I was working at. I was spinning Arcturus that I had washed by hand, picked by hand, and then was hand carding for the folks to see and then spinning on my Majacraft Rose. No, it's not period with the plastic bobbin, but castle style wheels were around during the Civil War as Irish immigrants were bringing them over during that time period. Got lots of questions about the style as many hadn't seen that type, although they've seen the traditional style and the great wheel. We also had a drop spindle to demo on, too. How did VT Sheep & Wool Fest go?? Well, I'm about a week or two tardy from responding, but Garrett was kind enough to ask how did it go? Well, it was fine. Normally I share a booth with Ruth Ticknor of Sunrise Hill Angoras/Farm and her DH, Ed, puts up a few pics and note cards that are "farm related" as he's a professional photographer. This year, Ruth was in Michigan for schooling (doing it online, but every so often she needs to actually attend the campus). So that left Ed and me to man the booth. Tim was over in the animal section as we brought three rams (2 yearlings and a lamb) to sell. We hitched the sheep trailer to the truck and put the fibery goodness in the front of the sheep trailer, so that left the sheep in the back of the trailer. Fibery goodness loaded on Friday night, sheep first thing in the a.m. and Ed came over so we'd be giving him a lift there. It worked out well. Got there in once piece and offloaded the boys (the rams, not Tim and Ed). This was the first time we brought livestock to the festival. After sheep offloaded, we took the truck over to where the booth would be set up and offloaded all that. Would you believe, I didn't bring the camera, so no pictures of either set-up. I know I need to bring one and you would think the professional would remember, but didn't. He had even made a remark about that on Saturday. Sales were good. First thing, even before the festival opened, I sold Wilkins fleece that didn't sell at NH Sheep & Wool Fest. That left me with 4 more to sell, or haul back home, package up and send off to rovings. My cedar stashets were evidently priced too low as the first two to show any interest bought them all! All the rovings but the one I've finally titled as Spring in Vermont sold at the show. There was quite a bit of interest in the sheep with lots of questions and that was good to see/hear. I did stop by at one point and reached in to give Bergelmir a scritch and he took a swing at me. Evidently there was a "little child" (being kind here) that was banging on the fencing and really making him annoyed. Tim had warned the little child and he kept doing it. Oh well! None sold at the sale, but we did have a number of people who were curious and thinking about next year. All in all, I think a good experience. We stayed at the Day's Inn with points Tim had accrued from all his traveling. Thankfully his traveling gives us some benefit every so often. So we didn't have to drive back up to Essex Junction the next morning. Next thing to do is the Civil War Expo next Saturday. Will bring my camera and take pics of the set up and our get ups - have to dress somewhat authentically! Maybe tomorrow I'll show you the dye that was soaking in a jar over the Festival weekend. Today I'm getting ready for the Vermont Sheep and Wool Festival that is this weekend, September 6 & 7 at the Champlain Valley Expo in Essex Junction. I'm dyeing up a storm. I told Tim that I was going to be dyeing and his remark was how, by drowning, electrocution, etc. and I told him via chemicals (I know we have a weird sense of humor). This is some of the roving I've dyed already. Have one left that's working, so will see how that one does. Here are some shots of them close up so you can really see the colors. This first one is almost a celadon green. Not what I think of when I think of kelly green. This next one is a combo of bright red (that looks more pinkish), burgundy (that looks kind of purplish) and yellow. Makes me think of Easter. This next one is blue and some hint of a bluish green. Want to hit the beach anyone? Or maybe think of an iceberg? This next one was a feeble attempt to get something orangy that would make people think of fall. It's sort of that, but I'm not too sure! I've also been dyeing and stitching up some cedar "stash"ets. Here are a few that I need to piece together. Now how did I get that middle one so orangy?? And no, I don't take notes when dyeing, just like to shoot from the hip and hope I don't get anything that looks like puke! I was kind of bummed that the S&W festival is the same time as the AGM in Wisconsin, so I'll be missing all the Shetland people going to that. If you're in my neck of the woods, stop by the festival and say howdy. I'll be in a booth with Sunrise Hill Angoras and Studio One Photography (Ruth's DH). Okay, I'm trying to be better. Two weekends ago, DH and I went to Michigan. On the way out we dropped off a ewe lamb to Kara. Our main mission for going out to Michigan was genetics! We have a number of rams on the farm that all link back to Wilkins, our lovable head ram. We were looking at two ram lambs from Gail Former and at the time a ram lamb and adult ewe from Stephen Rouse. We looked at all of Stephen's sheep and it was like being a kid in a candy store. I want that one, and that one, and that one. Restraint prevailed and a bit of common sense (do we really need another unrelated ewe, even though she's awfully cute?) and so we left at the end of the weekend with a black gul ram lamb from Stephen and a nicely crimped moorit/fawn ram lamb. So far, they're not named and we're calling the one gul boy and the other uber crimpy. Any suggestions out there?? From Gail, we were looking at a mioget ram lamb (which we purchased) named Bach. We also leased a moorit ram lamb who carries the modifier gene named Coltrane. This second guy, if I'm remembering correctly, doesn't have iset in his background. That's a nice bonus. While there we also enjoyed the MFF (Michigan Fiber Fest - for those of you not in the know). It was a nice event. Got to see more Shetlands and Shetland people. Enjoyed putting faces to the names that are out in cyberspace. Also did a bit of shopping, not too much, since the big shopping was the ram lambs! More about that little shopping later. At the end of the trip we went home with 9 sheep and 1 French Angora bunny in the truck and trailer. Two Shetlands were dropped off to Rich Johnson in New York, Nadine Chounet picked up one Shetland, and Becky Colpitts picked up two ENORMOUS sheep (one BFL yearling and a UK Suffolk yearling). Ruth Ticknor was the proud owner of the FA rabbit, that she came to pick up, too. That was some trip and I'm still exhausted thinking of it. We left Michigan on Sunday around noon and got home Monday morning at 5 to 5:30am. Lots of gas stops and bathroom breaks (checking on the sheep the whole time) and the one stop to give Rich his sheep.